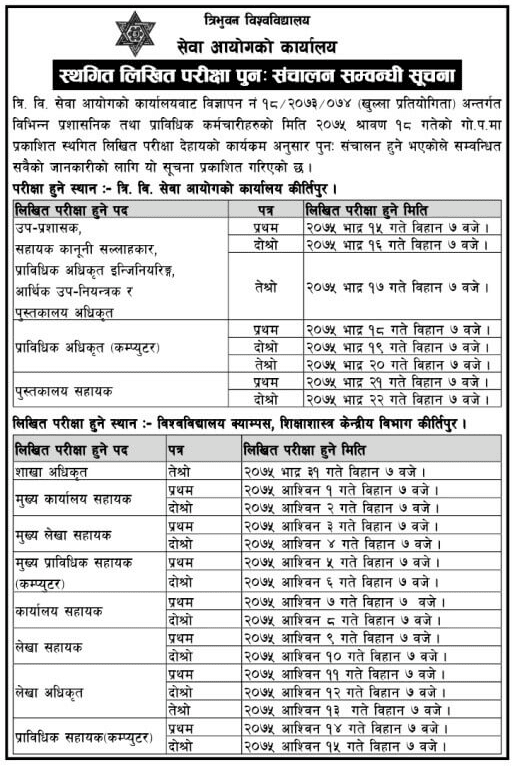 Home TU Jobs TU Service Commission Written Exam Schedule For Administrative and Technical Post. TU Service Commission Written Exam Schedule For Administrative and Technical Post. TU Service Commission published a notice for written exam schedule for the various post which was previously postponed. The written exam is for fulfill the vacancy in various administrative and technical post. Exam Postponed notice was published at Gorakhapatra on 2075/04/18. Check TU Service Commission Written Exam Schedule For Administrative and Technical Post below.